China,1898. Bands of foreign missionaries and soldiers roam the countryside, bullying and robbing Chinese peasants. Little Bao has had enough. Harnessing the powers of ancient Chinese gods, he recruits an army of Boxers - commoners trained in kung fu who fight to free China from "foreign devils." Against all odds, this grass-roots rebellion is violently successful. But nothing is simple. Little Bao is fighting for the glory of China, but at what cost? So many are dying, including thousands of "secondary devils" - Chinese citizens who have converted to Christianity. Boxers is the first in a unique graphic novel series that tells the point of view of the Boxer Rebellion. Little Bao is sick of seeing his countrymen treated poorly by foreign devils and so when a visiting man named Red Lantern arrives in his village, the men in their village jump at the chance to learn kung fu. When the others go off to help Red Lantern with a problem, Little Bao finds himself left behind. He follows the others, but is shooed away and objects are thrown at him, one including a map written by Red Lantern. So Little Bao follows the map and arrives where a large man is awaiting him, thinking him to be Red Lantern's replacement. The man holds the key to mystic vision, where he can summon the power of ancient Gods. With that power, he is able to clear the countryside of foreign devils, the ones he believe is ruining China. He becomes the leader of The Society of the Righteous and Harmonious Fist. With this leadership, he will have to make hard choices and continue to follow the three basic rules he has set in place. I really felt for Little Bao, and Boxers is a story of a younger son rising above and becoming strong enough to lead a rebellion. The graphics are really quite remarkable in this graphic novel and it was easy to tell the different characters apart. The thickness of the graphic novel also leant itself to a longer, more fulfilling story that kept me turning pages until the very end. History has always fascinated me and it has been a long time since I studied any one period. Boxers left me with a want to learn more about the rebellion in China and the events surrounded it. Final Verdict: If you like historical fiction and graphic novels, you will love Boxers, a graphic novel that blew me away. I'll be reviewing the next book Saints tomorrow, a book that takes a look at the other side of the Boxer rebellion. This sounds like a neat story. 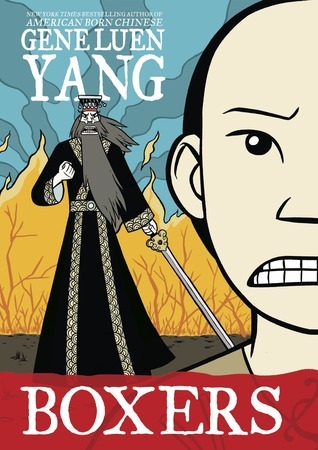 I have not linked historical fiction and graphic novels in my mind (I usually read SF&F graphic novels), but this sounds a great read (a graphic novel would be able to show the reader so much of the time period without having to describe it!). Thanks for the review. Just put this on hold at the library. Funny that they have one book (boxers) and not the other (saints). So I am going to have to request that they get the other one in so I can read them both! !